Dentists who fought to use a crocodile as their logo have been left smiling after a judge rejected a bid from clothing firm Lacoste to prevent them. Lacoste took legal action against The Dental Practice in Cheltenham, Gloucs claiming the crocodile was too similar to its globally-recognised emblem. The UK Intellectual Property Office dismissed the claim the logo could potentially harm Lacoste's business. 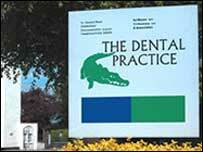 The French firm was told to pay £1,450 towards the dentist's legal costs. Tim Rumney and Simon Moore, from The Dental Practice, said: "We are happy the situation has been resolved but astonished by the length of time it took to reach this conclusion. "We do not consider ourselves to be in the same market place at all and do not see that we are treading on any toes." "We chose the sign with little second thought." Lacoste was unavailable for comment.